It’s been a year since lay-0ff. And, we’ve buckled down about as much as we can. Thankfully, I like to think that I have that gene of my Grandmother’s. The one I call the Yard Sale Gene. I don’t get attached to stuff. Not much, anyway. Not as long as by trading out my stuff, I can get new stuff. Stuff, of course, is what makes feathering our nests fun. And when the feathers get a little thin, old-looking, or boring it’s time to change it up a notch. That’s where Craigslist.org comes in. For those of you who’ve been living under a rock, Craigslist.org is a project designed for members or guests to shop other people’s tired stuff and make it their own. It’s a place to list or find jobs. Furniture. Clothes. To barter services. To, ah, um, meet people (not that I would know this–as I’ve been happily married for over ten years). Anyway, there’s a site for every city across the land. And, this is my stomping grounds. Yes. I said a trailer, and a van. I have annual summer water hyacinth customers. CUSTOMERS. I’ve met some wonderful people. I’ve met a few odd ducks, too, but mostly people just love the joy of searching for and finding what they are looking for, without paying for tax, shipping, and always with that little bonus of being able to haggle for the best deal. When my husband woke up one fine morning and told me of his idea… to swap around the downstairs playroom with the upstairs office. Great, I thought. And he budgets $500 for this project. 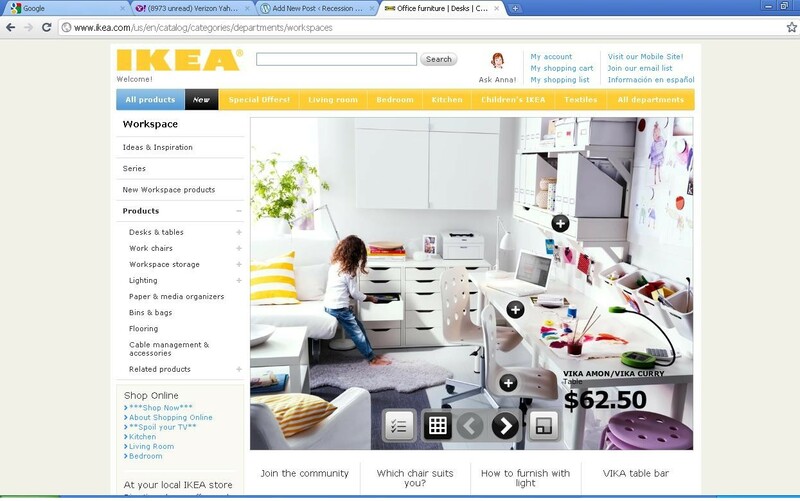 I’d already found my inspiration on the Ikea website and spent about twice that. Wonderful. We shopped online, priced out what we wanted, and had a bill more in the $1,000 range. Not outlandish for refurbing two rooms, but more than allotted. And I was allowed to shop! I would make the plan work to develop a “hang out/play/movie room for the girls, and a family craft room office for us. I went to work with Ikea’s handy office planner and measuring tape. I have two very different style rooms. One converted third car garage, and one square loft with a banister rail as one wall. Realistically, if both rooms were empty, and we completely started over with new furnishings, we could do it he said. Relegate my antique pinball machine to the garage where it would fall into a slow state of disrepair. Unacceptable. My grandfather’s antique file cabinet is actually a useful storage device for office supplies, and if I cleaned it out, would make a nice addition to a joint-family office. The kid’s Ikea storage drawers are full of things that they still play with, and a Barbie Three Story, 3-foot-square spin-able house is their favorite toy. I still had two trunks, a pretty, but un-functional desk, a pair of dusty chairs, and storage window seats filled with games we never play with. With one week to get the project organized, I took pictures, and posted each listing with as much detail as possible, for a price I could swallow. Pictures, you see, are the key to weed out the serious buyers from the idle lookie-loos. If your posting has pictures, the serious buyer will call. A lookie-loo could become a serious buyer if they see the right thing right away. The best part? Nothing has to be hauled out, dusted off, and sneered at by people only willing to offer a handful of bills. I set my prices, posted, and that first day had three offers on the desk. The chairs were gone by the middle of the week. By Friday, so was the big steamer trunk. A friend took the window boxes, for promises of future coffee dates. Done! With cash in hand, we made purchases from Ikea for the rest. Two long tables, drawers to turn them into instant “desks,” storage items such as file boxes, magazine boxes, and white rolling chairs to match. AND, the bonus of our shopping the end of the year sale? Two funky kids love seats to hug 90 degree walls, making the play room truly a “hang out room.” It was more than I dreamed we’d drive away with! Still, the book case I WANTED to make the office complete? I just couldn’t justify going almost $200 over budget expense. It remained, boxed and unbuilt, on the Ikea storage floor. I also kept discussing a “gift wrap” station, and that got pooh-poohed as a ridiculous notion. BUT, my grandmother–it seems–was smiling on me. A quick search of my local town and Ikea bookshelf turned up EXACTLY the item I was looking for. Within 5 miles of home, and for a fraction of the cost. But, better than that? After dropping off my daughter’s friend around the corner, I saw a small broken down, drop-leaf craft station. With an open front drawer for ribbon, and chalk board top for draw-happy kids. DONE! We basically flipped our furniture for funky. I’m still cleaning out and clearing stuff. We’re planning a MOMs Club rummage sale, and everything that doesn’t go there will go to good will. So, be inspired! Flip your furniture! Don’t get tied to stuff just because “you’ve always had it!” We might be living in these houses until forever, but we don’t have to stay tied to the same old same old! Let me know what you’ve done to flip yours!